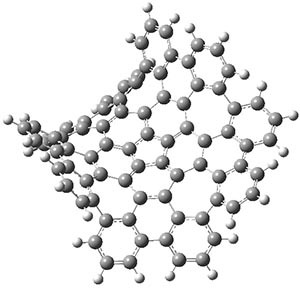 Scott and Itami report on a graphene fragment that is highly warped.1 They have prepared 1 by three separate procedures, one of which starts with corranulene and in two steps makes the product! 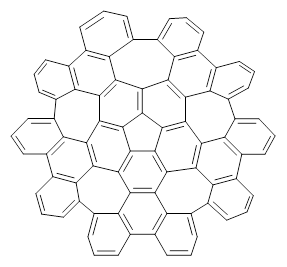 The five 7-member rings warp the structure so that it is non-planar. In fact the molecule has negative curvature, reminiscent of a riding saddle. They report the x-ray structure, outside of the fullerenes, the largest hydrocarbon reported by x-ray crystallography. 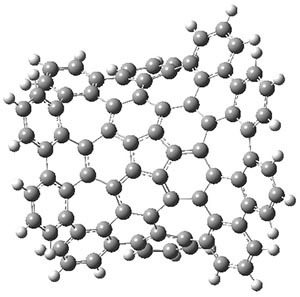 Because of its non-planar geometry, 1 does not pack well and so it is soluble in a variety of solvents. The authors have obtained the structure of 1 at B3LYP/6-31G(d), shown in Figure 1. The central corranulene component is a shallow bowl, much less shallow than in corranulene itself. This suggests that the compound might flip with a relatively low barrier. The computed barrier is only 1.7 kcal mol-1. Due to the negative curvatures associated with the seven-member rings, 1 is chiral and the ring flipping process leaves the chirality unchanged. A second transition was located that leads to racemization through a transition state of Cs symmetry. The barrier for this racemization is computed to be 18.9 kcal mol-1. 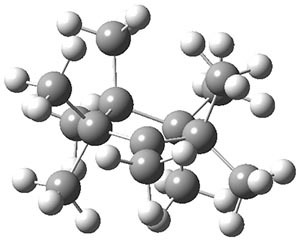 Variable temperature 1H NMR analysis does show that at room temperature 1 (substituted with one t-butyl ring on each of the ten exterior phenyl rings) undergoes rapid motion that equilibrates all of the protons. However, at lower temperature the signals for ring protons do separate. This leads to the barrier or the racemization process of 13.6 kcal mol-1. The ring flip is not frozen out at the temperatures explored. 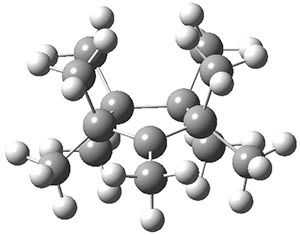 Compound 1 is an example of a very interesting negative curvature hydrocarbon, especially unusual for what might be considered an aromatic compound. 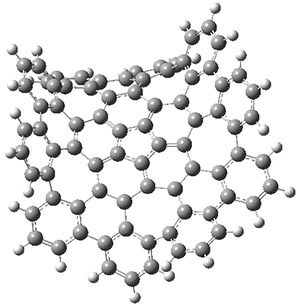 (1) Kawasumi, K.; Zhang, Q.; Segawa, Y.; Scott, L. T.; Itami, K. "A grossly warped nanographene and the consequences of multiple odd-membered-ring defects," Nat Chem 2013, advance online publication, DOI: 10.1038/nchem.1704. Accurate modeling the hydrophobic effect (or effects) is probably the biggest challenge to computational drug design (see for example this CC Highlight). The hydrophobic effect on protein-ligand binding is generally thought to come from the release of structured and entropically unfavorable water molecules from the hydrophobic surfaces of the ligand and binding pocket. However, is also possible that the release of strongly bound water molecules to the protein/or ligand contributes to this effect. 1) The thorough characterization, including x-ray structures, of the binding of homologous ligands provides a valuable benchmark for computational studies. The authors show that fluorination, commonly thought to increase the hydrophobic contribution to the binding free energy indeed increases the entropy of binding, but does so without decreasing the binding free energy. The fluorinated ligand is indeed more hydrophobic as measured by buffer/octanol partitioning so what's going on? One answer may be the difference in strongly bound water molecules observed in the protein-ligand x-ray structures: six and ten for the un- and fluorinated ligand, respectively. However, a simple correction based on the number of strongly bound water molecules is unlikely: a homologous un- and fluorinated ligand pair showed large differences in the binding enthalpy and entropy but smaller difference in number of strongly bound water molecules (four and seven, respectibely). 2) The supplementary material provides a fantastic list of important papers in this area. I have reproduced the list below and added links, where available, to the articles. Water-centric view of protein-ligand binding (relevant references in chronological order). 1. Solvation. A Molecular Dynamics Study of a Dipeptide in Water. 2. A Direct Measure of the Contribution of Solvent Reorganization to the Enthalpy of Binding. 3. How Water Provides the Impetus for Molecular Recognition in Aqueous Solution. 5. Hydrophobicity at Small and Large Length Scales. 6. Computational Prediction of Native Protein Ligand-Binding and Enzyme Active Site Sequences. 7. Role of the Active-Site Solvent in the Thermodynamics of Factor Xa Ligand Binding. 8. Hydrophobicity of Protein Surfaces: Separating Geometry from Chemistry. 9. The Thermodynamics of Protein-Ligand Interaction and Solvation: Insights for Ligand Design. 10. Dewetting and Hydrophobic Interactions in Physical and Biological Systems. 11. Extent of Enthalpy-Entropy Compensation in Protein-Ligand Binding. 12. Contribution of Explicit Solvent Effects to the Binding Affinity of Small-Molecule Inhibitors in Blood Coagulation Factor Serine Proteases. 13. Dissecting the Hydrophobic Effect on the Molecular Level: the Role of Water, Enthalpy, and Entropy in Ligand Binding to Thermolysin. 14. Ligand Binding Stepwise Disrupts Water Network in Thrombin: Enthalpic and Entropic Changes Reveal Classical Hydrophobic Effect. 15. Development of New Cyclic Plasmin Inhibitors with Excellent Potency and Selectivity. Enthalpy-entropy compensation in protein-ligand binding (relevant references in chronological order). 1. Enthalpy-Entropy Compensation Phenomena in Water Solutions of Proteins and Small Molecules: A Ubiquitous Propery of Water. 3. Application of a Generalized Enthalpy-Entropy Relationship to Binding Cooperativity and Weak Associations in Solution. 4. Enthalpy-Entropy Compensation is not a General Feature of Weak Association. 5. Extent of Enthalpy-Entropy Compensation in Protein-Ligand Binding. 6. Thermodynamics of Ligand Binding and Efficiency. 7. A Multidisciplinary Approach to Probing Enthalpy-Entropy Compensation and the Interfacial Mobility Model. 8. Enthalpy-Entropy Transduction Caused by Conformational Shifts can Obscure the Forces Driving Protein-Ligand Binding. 9. Extreme Entropy-Enthalpy Compensation in a Drug-Resistant Variant of HIV-1 Protease. 10. Dissecting the Hydrophobic Effect on the Molecular Level: the Role of Water, Enthalpy, and Entropy in Ligand Binding to Thermolysin. The nine methyl groups of nonamethylcyclopentyl cation 1 all interconvert with a barrier of 7 kcal mol-1. However, at low temperature only partial scrambling occurs: there are two sets of methyl groups, one containing five groups and the other containing four methyl groups. The barrier for this scrambling is only 2.5 kcal mol-1. While this behavior was found more than 20 years ago, Tantillo and Schleyer1 only now have offered a complete explanation. 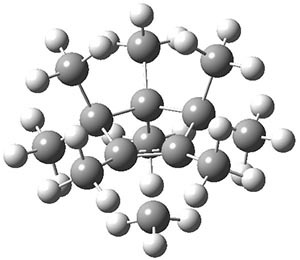 The ground state structure of 1 is shown in Figure 1 and has C1 symmetry. The two pseudo-axial methyl groups adjacent to the cationic center show evidence of hyperconjugation: long C-C bonds and Me-C-C+ angles of 100°. The transition state TS1¸also in Figure 1, is of Cs symmetry. This transition state leads to interchange of the pseudo-axial methyls, and interchange of the pseudo-equatorial methyls, but no exchange between the members of these two groups. The M06-2x/6-31+G(d,p) and mPW1PW91/6-31+G(d,p) estimate of this barrier is 1.5 and 2.5 kcal mol-1, respectively. This agrees well with the experiment. Figure 1. B3LYP/6-3+G(d,p) optimized geometries. A second transition state TS2 was found and it corresponds with a twisting motion that interconverts an axial methyl with an equatorial methyl. This TS has Cs symmetry (shown in Figure 1) and the eclipsing interaction give rise to a larger barrier: 7.3 (M06-2x/6-31+G(d,p)) and 6.7 kcal mol-1 (mPW1PW91/6-31+G(d,p)). So twisting through TS2 and scrambling through TS1 allows for complete exchange of all 9 methyl groups. An interesting point also made by these authors is that these three structures represent the continuum of cationic structure: a classical (localized) cation in TS2, a bridged structure in TS1 and hyperconjugated cation in 1. (1) Tantillo, D. J.; Schleyer, P. v. R. “Nonamethylcyclopentyl Cation Rearrangement Mysteries Solved,” Org. Lett. 2013, 15, 1725-1727, DOI: 10.1021/ol4005189.